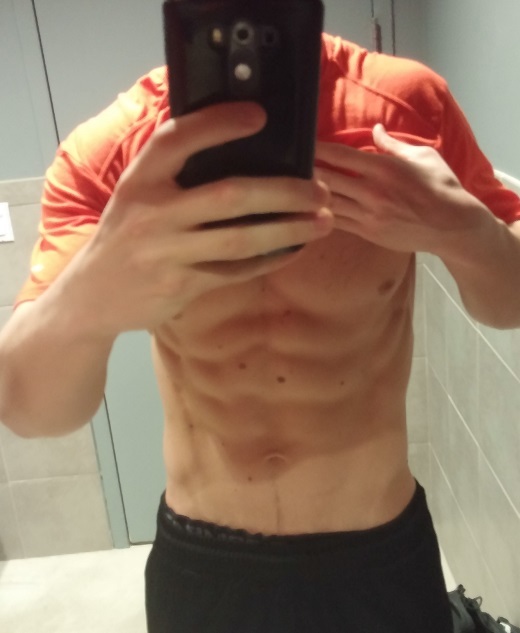 Compare your graph (workout results) to your own graph over time, don’t compare to others! Now a little competition I believe is a good thing — other trainers and myself have many friendly competitions and we motivate each other that way. Just try to make sure that you’re on a somewhat even playing field, otherwise it can be discouraging. Also, I don’t believe that estimated calorie burn for a workout is that important. Why? Read on! High Intensity Interval Training is a very effective training style because the metabolic processes that it stimulates, not just about the calorie burn. Let’s take a look at some of the benefits of High Intensity Interval Training. 1. HIIT exercise improves endogenous antioxidant system and strengthens red blood cells against free radical damage. Here is a very clear health benefit. Essentially this leads into anti-aging and longevity for most people. Because we are humans and use oxygen, there are byproducts which are called free radicals. Antioxidants neutralize free radicals. 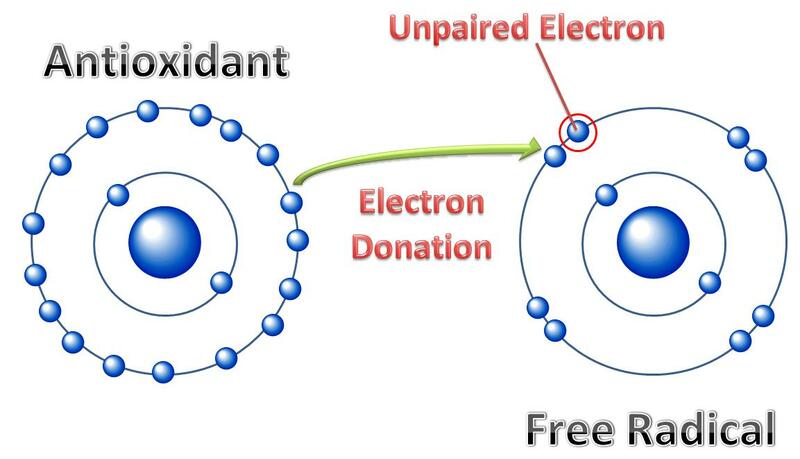 Free radicals are analogous to that which causes cars to form rust. Antioxidants prevent your body from this damage. While we get many important antioxidants from food, we know that High Intensity Exercise stimulates the production of endogenous (within our body) antioxidants. 2. 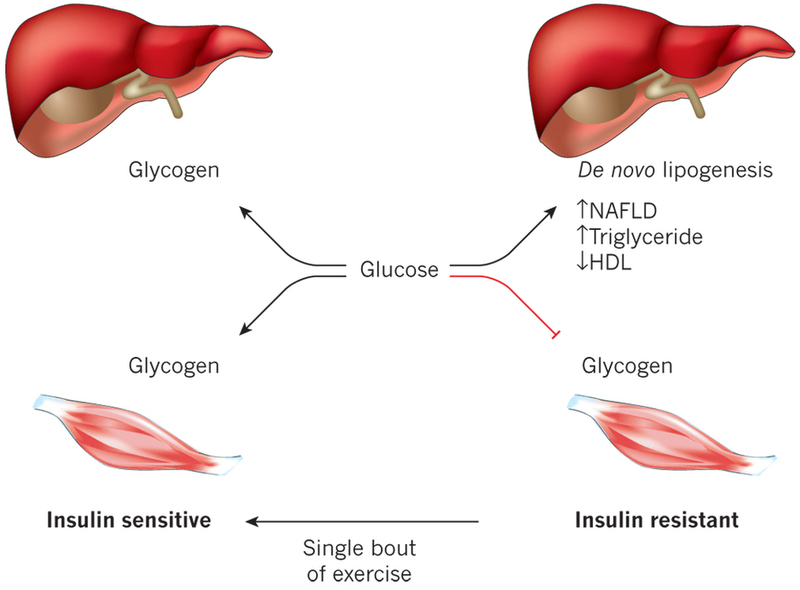 Glycogen concentration increases in muscles and in the liver. Glycogen is considered “easy access” energy for the muscles and organs. Unlike fat cells, energy stored as glycogen is lean energy. When you are able to increase the glycogen concentration in the muscles, it may improve overall muscle tone, energy, and power output. Furthermore, improving glycogen concentration in the liver is VERY important for people who consume fruits and berries (or even high fructose corn syrup but I’d NEVER consume that). The reason is because unlike other types of carbohydrates, fructose is typically either stored in the liver as glycogen or it is released into the blood stream and excessive energy from fructose can easily be stored as body fat. The muscular system does NOT favor fructose. Sidenote: Don’t be afraid of fructose found in foods like blueberries. Blueberries are a wonderful source of antioxidants that protect the brain, eyes, and so many more organ systems. I wouldn’t blame anybody’s lack of fat loss on blueberries. Besides, while the glycogen stored in liver is not going to be used by your muscles, it WILL be used by other important parts of your body such as the central nervous system. The key point here is that HIIT exercise allows your body to utilize more carbs to your lean system without going to body fat. 3. May improve overall testosterone and testosterone to cortisol ratio. For my men and boys out there, this needs no explanation. For my women, just know that having healthy levels of natural testosterone in your body is ESSENTIAL and UTTERLY CRUCIAL to having a lean, toned physique. Without a fair level testosterone, you’ll never have that lean muscle tone. Moreover, by having less cortisol (the stress hormone) you are way more likely to burn fat… especially abdominal fat. This study was done on females! If you have poor insulin sensitivity, it means that your body must create and produce more insulin in response to food intake. We all know that this can lead to diabetes over time. However, in the short term, having poor insulin sensitivity creates stress and inflammation in the body which can also lead to Metabolic Syndrome. If you have high stress and inflammation in the body, it will be very challenging to reduce body fat to a nice toned physique. Poor insulin sensitivity = fat cells likely to get the signal to grow larger. Be careful! Processed foods, sugar (candy etc), and alcohol reduce insulin sensitivity. 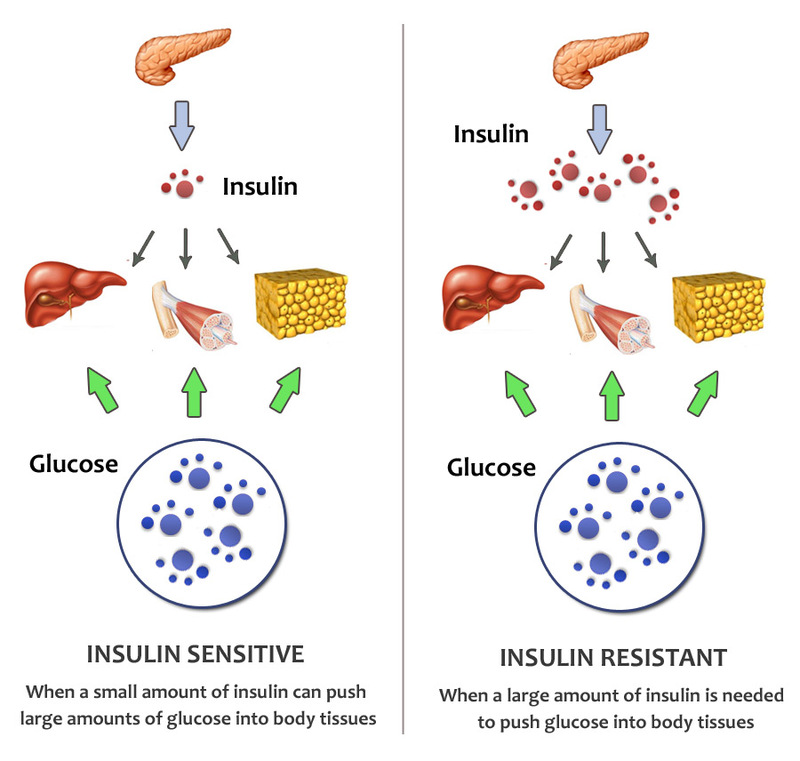 When you are insulin resistant, it has many negative implications. For one, you have higher blood glucose because the glucose can’t get into the cells to be used/stored as energy and this is not good for metabolism. Also, your pancreas get stressed out, inflammation increases and you’re unlikely to be in a state of potential fat burning. We want to put our body into a good metabolic state. Of course because of this blog, you know that HIIT exercise is helpful with insulin sensitivity. You can also improve insulin sensitivity by eating a plant rich diet, including high fiber, high antioxidant, high nutrient, moderate protein and moderate healthy fats. 5. Increases natural human growth hormone response. Remember when the actor Sylvester Stylone got caught at the airport for having synthetic HGH? 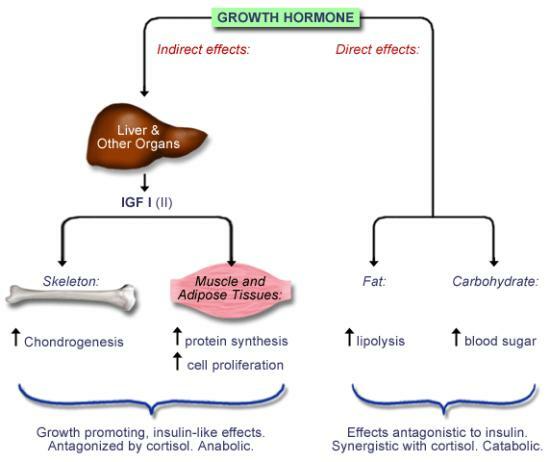 Human growth hormone is the anti-aging hormone. It’s great for having a strong, lean body that recovers well from exercise and stress. High intensity training improves the amount of human growth hormone available to your cells. Nevill et al. examined the growth hormone (GH) response to treadmill sprinting in female and male athletes and showed that there was a marked GH response to only 30 s of maximal exercise and the response was similar for men and women but greater for sprint compared to endurance trained athletes. GH concentration was still ten times higher than baseline levels after 1 hour of recovery. 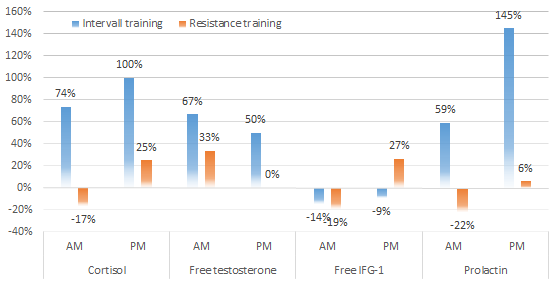 HGH increases fat burning, amongst a host of other beneficial properties. These are basically some of your very important fat burning hormones. Catacholamine’s such as epinephrine have been shown to drive lipolysis and are largely responsible for fat release from both subcutaneous and intramuscular fat stores. 7. May target the abdominal fat specifically and belly area more effectively than other exercise. If you haven’t caught on yet, HIIT exercise is more about the cocktail of hormones released into the body following the workout and LESS to do with the actual amount of caloric expenditure during the workout. There’s a reason we aren’t doing steady state cardio — long endurance runs of 60 minutes are an outdated and ineffective form of attempted fat loss. The only reason to run long distances is for your own enjoyment, benefit, or mental satisfaction. I say bluntly: long distance running is not good for the body and science is really beginning to prove that. Some of the hormones released after HIIT exercise (and not from steady state cardio) are more likely to target belly fat. If you’ve done any interval training, you may have at least heard of the EPOC effect. 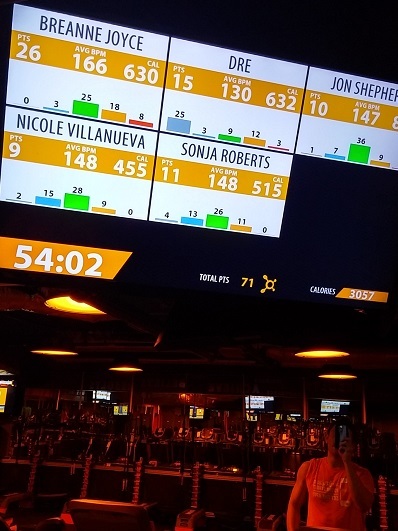 At Orangetheory Fitness Seattle, where I currently coach over 20 high intensity classes per week, our entire workout is based off of the science of the EPOC effect. 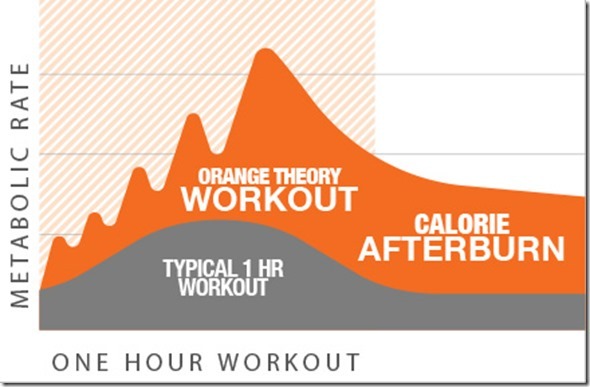 Our goal is to get you into the “Orange Zone” (84% or greater) for 12-20 minutes (or more) during your 60 minute workout window. By achieving that, you are guaranteed the EPOC effect. The postexercise oxygen uptake in excess of that required at rest has been termed excess postexercise oxygen consumption. An exponential relationship between exercise intensity and EPOC magnitude has been demonstrated. EPOC forces the cells to uptake a significantly more amount of oxygen following the workout and the byproduct of this effect is increased calorie burn for the hours and potentially days following each successful HIIT workout. Gotta rep my people here, but EPOC is real with any effective HIIT workout. I can train you into EPOC without any equipment whatsoever, but the treadmill and rowers are definitely helpful tools. So ultimately does it really matter if you burn an estimated 400 calories or an estimated 600 calories in a workout? In my opinion, no, it isn’t that important. We know from science that HIIT exercise is about the bigger picture. HIIT workouts are intended to put your body into a physiological state of greater metabolism for the hours following the workout. During this post-workout period, you will maximize your fat burn by consuming nutrient rich, whole, and plant based foods. Just because the standard American diet is absolute sh*t, doesn’t mean that having a salad and carrots once a day is suddenly healthy eating. Stay tuned for this blog, we’re going to hit some clutch nutrition topics really soon here. If my answers aren’t good enough for you about this topic, then I ask that you also re-define what it means to have a successful workout. Have a goal. Every. Single. Workout. Even one minor, achievable goal can help you feel successful after an intense workout. Example goals: I want to hit a 100 meter row in under 20 seconds. I want to hit a 200 meter row in under 40 seconds. I want to run 10 mph for 30 seconds straight. I want to use the 30 pound dumbbells on a lower body exercise. etc. Even if you successfully complete a single goal within a larger workout, you can still have that feeling of being successful (and you truly are, successful) even if the rest of your workout wasn’t as great or you didn’t achieve your target calorie burn. And my final closing note is that if it’s really important for you to want to burn a lot of calories, then make sure that you are ON TIME to your workout, not two minutes after, not four minutes after. Be ready at the door just as your trainer invites you in, then it’s on baby let’s goooo!!! Stay tuned for more, I’ll keep answer questions that I get frequently and I’m going to take your nutritional understanding to a whole new level. The effects of high-intensity interval training on glucose regulation and insulin resistance: a meta-analysis.